This article is about the neighborhood in Philadelphia. For the community in Montgomery County, see Cedarbrook, Pennsylvania. 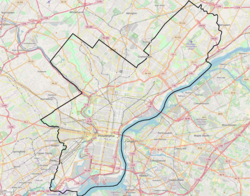 Cedarbrook is a neighborhood located in the Northwest Philadelphia. The Ivy Hill neighborhood is roughly the northwestern half of Cedarbrook. Ivy Hill Cemetery (established 1867) forms the geographic heart of the neighborhood. (The neighborhood most likely takes its name from the cemetery [rather than vice versa], as the area was woods and farmland when the cemetery was established.) Ivy Hill Road is sometimes mistakenly restyled as "Ivyhill Road"—most notably on its own newest street signs. Stenton Avenue to the southwest (a non-official intra-Philadelphia boundary, but nevertheless unequivocally dividing Cedarbrook from East Mount Airy). Washington Lane to the southeast (beyond which lies West Oak Lane). The 19150 ZIP code corresponds almost entirely with the Cedarbrook neighborhood. According to the 2000 US Census, the neighborhood has a total population of 25,274. The median household income is $42,342; the median family income is $49,508. The racial makeup of the neighborhood was 2.2% White, 95.3% Black or African-American, 0.2% Alaskan or Native American, 0.0% Native Hawaiian or Pacific Islander, and 1.8% from two or more races. Hispanic or Latino of any race accounted for 1.1% of the population. Approximately 10% of the population lives below the poverty line. This page was last edited on 13 March 2019, at 16:33 (UTC).